Almost an entire century after the world's first captivating introduction to Dracula, the studio that pioneered the genre reawakens the legend of Dracula in a pulse-pounding action adventure. 'Dracula Untold's' stunning visual effects showcase the infamous story in an exciting, unique format, breathing new life into the ancient tale. 'Dracula Untold' sees Vlad the Impaler, Price of Transylvania (Luke Evans, 'Fast & Furious 6', 'The Hobbit', 'The Crow') make a deal with an aged vampire (Charles Dance, 'Game Of Thrones', 'Last Action Hero') that gives him the super strength of the demon for three days, allowing him to protect his people and his family from the Turks who threaten to kidnap the town's children. Providing he doesn't drink blood, Vlad will turn back into a human after the three days. Vlad must use his powers to protect his people, while ignoring his overwhelming thirst for human blood. The 'Dracula Untold' competition has now closed. Winners will be announced shortly. Competition opens at 5pm AEDT on Sunday 8th March 2015 and closes at 11:59pm AEDT on Sunday 15th March 2015. Five winners will be chosen at random on Monday 16th March 2015. To successfully win, entrants must fulfil the above entry conditions before the time the competition closes. Current members/followers are eligible to enter the competition. Only one entry per person. Only one winner per household. To be a valid winner, the entrant must not have won a prize from SWITCH within the last 28 days. Each winner will receive one Ultraviolet Blu-ray copy of 'Dracula Untold'. By entering, you agree to receive occasional emails from SWITCH in the future. If you decide to unsubscribe from these updates, any further entries will not be applicable. Only Australian residents are eligible to enter. 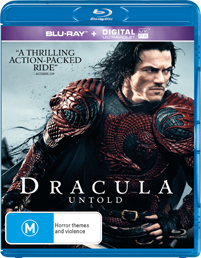 'Dracula Untold' is available on Digital, Ultraviolet Blu-ray and Ultraviolet DVD on Thursday the 12th March 2015 from Universal Sony.